Homemade weedkillers may destroy surrounding plants if not applied with caution. Weeds are an annoyance for gardeners, but in most cases removing weeds does not require toxic chemicals. Numerous home remedies prevent weeds and eliminate them from yards and gardens. Homemade remedies to kill weeds are inexpensive and provide a harmless, green alternative to harsh chemicals. Daily weed monitoring and keeping an eye out for developing weeds in your garden and yard is crucial to keeping weed populations under control. Young, small weeds are easiest to treat, remove and kill. If you allow weeds in your yard or garden to mature, root systems become established, making it difficult to kill the weeds--not to mention more challenging to remove by hand. According to the North Coast Gardening website, weeds can be remedied using pelargonic acid formulas produced with organic herbicides. Pelargonic acid burns off the waxy protection cuticle of plant leaves to kill weeds. Kill small weeds with household vinegar composed of 5 percent acetic acid concentration. Household vinegar effectively remedies small weeds but does not work as well on mature plants. According to The Garden Counselor website, salt, soap and vinegar combinations can be created to remedy weeds but are not recommended for use in areas where you plan to grow plants, such as gardens, lawns and flowerbeds. The solution is a combination of 1 cup salt, 1/2 tsp. liquid soap and 4 cups vinegar, and it can be used on areas such as sidewalks and driveways. The Garden Counselor asserts that using vinegar as a weed remedy can alter pH levels in your soil and should be applied with caution in areas where other plants grow. Soil with a high salt content is not hospitable for growing plants, and salt should be used as a home remedy only in areas such as driveways and walkways where you do not intend to grow additional plants. Bleach, which also is used as a home remedy to kill weeds, can significantly alter soil pH levels, too, and should be applied carefully and as far as possible from neighboring plants. Using your hands to pull weeds is an effective remedy that doesn't require homemade concoctions or chemicals. According to North Coast Gardening, pulling weeds reduces the threat of herbicide drift, which prevents chemicals from creating an inhospitable soil environment for plants. 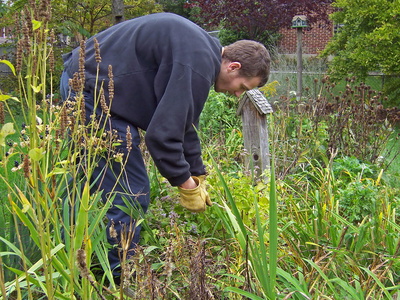 Removing weeds is easiest when surrounding soil is damp and moist. Soak areas to be pulled with water first, or weed after a rain for easiest removal. Proper mowing can prevent weed problems from developing in your yard. Maintaining high levels of grass prevents weeds from receiving sun exposure essential for growth. Setting your lawnmower to cut grass at a higher level and mowing weekly will help to prevent weeds from producing seeds that can increase weed coverage and growth. Also prevent weeds in your garden by installing weed-blocking landscape fabric before planting seeds. The fabric may be used to prevent weed growth when constructing new paver-block patios or walkways, too. Newspaper is an economical option for suffocating weeds and preventing new growth in gardens and flowerbeds.